You certainly have heard about DJI for its very famous drones such as the Phantom 4 or the Mavic Pro. The Chinese giant is not planning to stop there and has decided to start producing some smartphone stabilizers such as the subject of our DJI Osmo Mobile review and some cameras with integrated stabilizers such as the Osmo+. As far as smartphones are concerned, the DJI Osmo Mobile is really one of the best, if not, THE best solution you’ll find on the market. Indeed, it will make your videos perfectly smooth without (almost) any vibration which, up until now, turned your videos into some horrible things to watch. Now, you are a real professional ! Without wasting any second, we invite you to discover our DJI Osmo Mobile review in which we will look into 6 precise criteria that matters for us and for most people. Our first criterion we are going to analyse in this DJI Osmo Mobile review is its battery life, as always ! On this point, the smartphone stabilizer of the Chinese drone manufacturer and stabilizers doesn’t disappoint us at all. In fact, the manufacturer boasts a battery life of 4h30. During our DJI Osmo Mobile test we did to make this review, we managed to used it for a bit longer than 4 hours. These impressive stats rely on a surprisingly enough low capacity battery : 980mAh. We didn’t think at all it will last so long during our DJI Osmo Mobile review. The functioning of this smartphone stabilizer is therefore very well optimized in order not to lose a single piece of energy of this 980mAh battery. Still, as you’ll see later in this DJI Osmo Mobile review, the motors would work perfectly during the whole test session. It is, by the way, not the first time that we notice this very small gap between our DJI Osmo Mobile review and what the manufacturer boasts. This is very pleasant to see that they are not trying to lie to us. Only a few manufacturers are that honest regarding the performances of their smartphone gimbals. What happened to us during our DJI Osmo Mobile test was quite embarrassing though. Indeed, our iPhone 7 battery gave up on us before our stabilizer ran out of battery. You therefore need to be careful to have both your phone and stabilizer batteries fully charged when you want to use them. In the end, we had to change our phone and replace it with a Honor 8, which has quite the same size in order to keep on doing our DJI Osmo Mobile review which was far from being over. 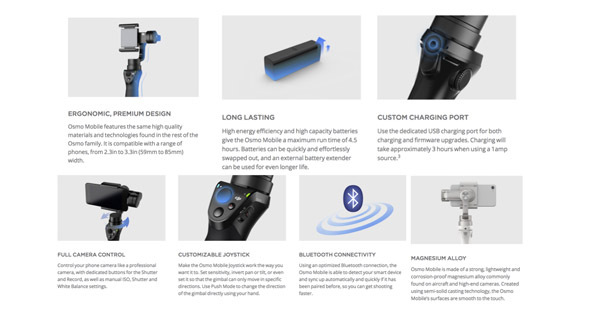 It is also interesting to notice in our DJI Osmo Mobile review that this smartphone stabilizer unfortunately doesn’t enable you to recharge your phone while in use…which is a bit sad… For instance, the smartphone stabilizer Zhiyun Smooth 3 enables you to recharge your phone while you are using the gimbal and it can last up to 14 hours thanks to an outstanding battery. These 14 hours are very far away from the battery life we had during our DJI Osmo Mobile review. This little “memory lapse” is a bit of a shame according to us. If we compare it with a Gopro stabilizer such as the Feiyu G4S, G5 or the EVO GP PRO, you can charge your Gopro while in use and this is really pleasant. 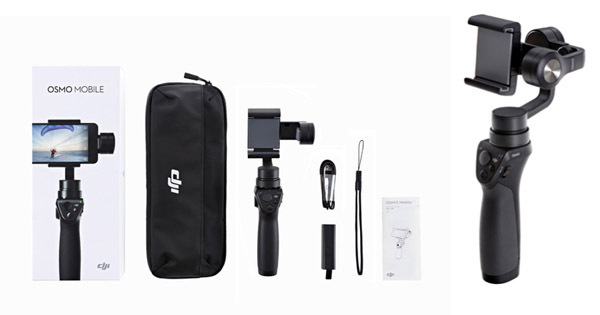 Still along the same line, among the other smartphone gimbals competitors such as Zhiyun with the Zhiyun Smooth 3, you’ll have this option… Still, this is only a little weakness of our DJI Osmo Mobile review. In order to have a better battery life during our DJI Osmo Mobile review, we used a frequent “trick” which consists in connecting an external battery to your gimbal’s grip. This will enable you to have a better battery life…even though it is not very useful for transportation and action moves. In the end, the grade in this section of our DJI Osmo Mobile review is still very good : 9,4/10. It is indeed very rare to find stabilizers with such a good battery life. Our next step in our DJI Osmo Mobile review will concern the quality and the reliability of this Chinese smartphone stabilizer. One more time in this DJI Osmo Mobile review, the quality and the reliability of this smartphone stabilizer really impressed us. As soon as we took it out of the box to start our DJI Osmo Mobile review, we directly knew that it was going to be a good one. Indeed, you see that this is everything but a toy and that the quality of the product is real. It is both robust and light in order to keep a very good user experience. We will look into it more precisely later in our DJI Osmo Mobile review but the motors are certainly the most reliable you’ll find on the market. In fact, they really ensure a high quality functioning. As far as the motors are concerned, the subject of our DJI Osmo Mobile review did not disappoint us. They are really strong and will perfectly fulfill their mission which is stabilizing your smartphone. And this, no matter its size or its weight…as long as it fits the expected dimensions, of course ! The supports which hold your phone are, one more time, very strong too. You have no worry to have in this regard. During our DJI Osmo Mobile review, we really pushed it hard and tried to see the limits of the support which holds your phone…it didn’t move at all. Therefore, we gave it a very good grade of 9.2/10 in our DJI Osmo Mobile review for all these reasons. 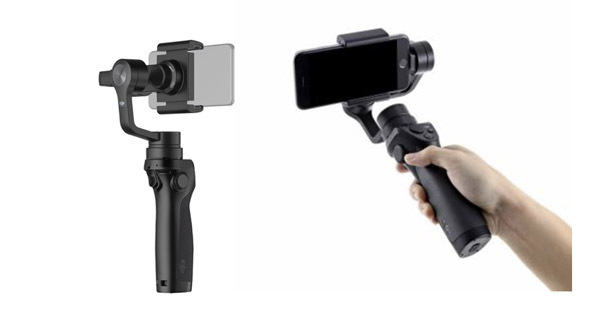 One more proof of the quality and the reliability of this smartphone stabilizer which is today the subject of our DJI Osmo Mobile review is the reactivity of the motors. As a matter of fact, if you turn the “sport mode” ON, directly in your mobile application, they will follow your target with an impressive speed. For every use in a sportive environment, we strongly recommend you to use this mode. Still, if you want to make some precision shooting, you can also stay in “normal” mode and you’ll be able to do some very smooth and stabilized slow videos. Here we are at a very important criterion of our DJI Osmo Mobile Review. As many people, you are certainly sick and tired of shaky videos which made them almost unwatchable if you shoot them with your smartphone alone because of the consistant vibrations… All your moves and little shocks you’ll encounter will directly impact the quality of your video. The quality of the cameras of your smartphones are good, though… Some are now able to shot in 4K (iPhone 7) which is just insane ! For our DJI Osmo Mobile review, we used an iPhone 7 and an Honor 8. Hopefully, there is now some solutions to fight against this that are provided by a few manufacturers ! There is not only DJI, but also EVO, Feiyu or Zhiyun which offer some very good solutions. During our DJI Osmo Mobile review we could only admire the quality of the stabilization which is like day and night if you compare with your videos without stabilization. Be careful, in order to have a nice and smooth stabilization, you’ll need to calibrate your gimbal first BEFORE you turn on the motors. It is very important, be it for Gopro or smartphone stabilizers to fix your camera on your stabilizer before you switch it on ! Concretely, you’ll have to find the good balance by adjusting the gravity center in order to strike the good balance. In fact, once you have found the good balance, then, it’s only fun and pleasure. The videos we managed to shot with our smartphone stabilizer during our DJI Osmo Mobile review were just awesome. But…in the beginning of our test, we hadn’t the good balance so it was shaky. Do not neglect this part which is very important. If you don’t do the adjustments, you might be a bit disappointed, and it is totally understandable. Then, you’ll be able to move in every direction, you’ll get a smooth and stabilized image, like us during our DJI Osmo Mobile review. Finally, you’ll get a video which is pleasant to watch and you’ll be able to share it with your friends. One very important difference is mainly when you watch it on bigger screens such as a computer or a TV. In fact, on the phone, a shaky video is sometimes watchable…whereas it would be impossible on bigger screens. Despite everything, our grade in this section of our DJI Osmo Mobile review is “only” 8,8/10. This is explained by the fact that, even though the quality of the motors and the stabilization are very good, it’s not the best you’ll find… Some smartphone stabilizers such as the EVO SP-PRO, for instance, or the Feiyu SPG, or SPG Plus offer a better stabilization. Of course, we are being very meticulous on this point and this is only a very little detail. Still, we are there to compare and this is the main goal of our DJI Osmo Mobile review. If we don’t compare with the other smartphone gimbals, there would be no point in doing such a review. Don’t think that the quality of the stabilization is not good…it’s just a bit behind the other stabilizers we quoted, but only in this category ! As you can see in our smartphone gimbal comparison, the subject of our DJI Osmo Mobile review still ranks first on the average grade. In order to help you decide and find the best smartphone stabilizer, we are forced to be extremely precise. In the end, whatever happens and no matter what your choice will be for your smartphone stabilizer within the ones we present to you on our website, the difference in your videos will be huge, enormous, gigantic,… ! If you are used to Facebook live videos you’ll be pleased to use you smartphone stabilizer to make even better videos. After our DJI Osmo Mobile test, we didn’t even dare to shoot videos without our stabilizer. In the next section of our DJI Osmo Mobile review, we’ll see the numerous functions and options that you’ll find with this smartphone stabilizer. So many good functions ! You won’t be indifferent ! It is certainly in this category of our DJI Osmo Mobile review that this smartphone stabilizer has the best assets. In fact, you won’t lack any function with this awesome product. The Chinese manufacturer really thought about everything a customer would like to find and you’ll be able to shoot videos which look like professional’s ones. We don’t really know where we can start this DJI Osmo Mobile review for this criterion…there is just too many things to talk about ! In order to use your smartphone stabilizer to its maximal capabilities we used, during our DJI Osmo Mobile review, the mobile application that you can download for free, for iOS or for Android. Once it’s done, you have so many options in front of you and you can do almost everything ! Let’s start with the function we liked best during our DJI Osmo Mobile review : the moving Time Lapse. Thanks to your smartphone stabilizer, you’ll be able to shoot awesome moving time lapse. This is really simple and you just have to set a point A (starting) and point B (arrival) on your smartphone screen and then, just wait. It will automatically move from left to right (or right to left) and take Time Lapse pictures. We were very pleased by this function which works very well and is very easy to use. Even at the very beginning of our DJI Osmo Mobile review, we managed to use it without any problem. The outcome is just stunning and you’ll be able to have wonderful Time Lapse during your vacations for instance, while filming a sunset at the beach. For this DJI Osmo Mobile review, we tried it during day time and night time, and the outcome was awesome in both situations. The second very pleasant function that we enjoyed using during our DJI Osmo Mobile review is the panoramic mode. Thanks ro the very good stabilization you’ll get with this smartphone stabilizer, you pictures will be extremely clear. Furthermore, your stabilizer will take care of the assembling of the different photos it has taken for your panoramic. One more time, this function works thanks to the mobile application we strongly invite you to instal for an easy and pleasant use. We took a very close look during our DJI Osmo Mobile at the light exposure on the panorama that has been created by the application. We have to tell you the result was very very good and the app really works well and does the work it has been created for. The changes in exposure are perfectly well compensated to get a nice and naturel picture. This is not the case of all smartphone stabilizer, such as, for instance, the Zhiyun Smooth Q, which does a pretty bad job as far as light exposure is concerned. And if all this is not enough, the subject of our DJI Osmo Mobile review also enables you to do long exposures shots for very artistic outcomes. Quite a few smartphone stabilizers offer this function but we have to say that none gave us a so good result. Our DJI Osmo Mobile review is really positive about it and we can congratulate the manufacturer for the very good work. Thanks to the joystick you have on the grip, you’ll easily be able to control the motors and have awesome long exposures shots, very customised. In the end, for the people who own a Gopro Hero 5 Black camera, you can fix it on your smartphone stabilizer thanks to an adaptor. We didn’t use it during our DJI Osmo Mobile review but it’s nice to know it exists and this shows the versatility of this stabilizer. The price is approximately 20$ and you won’t need to buy 2 gimbals if you want to shoot with both your smartphone and your Gopro. It is very easy to use and the quality of the stabilization is convincing. We really took this function into account for the grade of our DJI Osmo Mobile review. This makes a grade of 10/10 in this section of our DJI Osmo Mobile review because of the versatility and the so many functions (and their quality) you’ll have with this smartphone stabilizer. We’ll see later in our DJI Osmo Mobile review the different modes you can have in terms of motors “blocking”. This section will be seen in our “controlling” category we’re just about to start. Our DJI Osmo Mobile review would not be comprehensive if we don’t take into account this very important criterion. As far as controlling is concerned, we have to start with the beginning. The first thing you’ll have to do, like us during our DJI Osmo Mobile review is to fix your smartphone on the gimbal. Its size needs to be within 58 and 84mm which is the size of most current smartphones between the iPhone 5S to the 7 Plus and other phones with same dimensions. As we already said earlier in the DJI Osmo Mobile review, we used two different smartphones, an Honor 8 and an iPhone 7 and the stabilization was perfect for both of them. As far as controlling to its first sense is concerned, you’ll find a few buttons on the grip and a trigger behind it which will enable you to take control of your smartphone and to switch from one mode to an other. What we enjoyed during our DJI Osmo Mobile review was the fact of being able to change the camera of your smartphone by clicking 3 times swiftly on the trigger. You’ll directly turn into selfie mode that you’ll certainly enjoy. If you hit the trigger twice, the subject of our DJI Osmo Mobile review will go back to its initial position in order to rebalance your smartphone if ever it lost its balance after some strong and consistant moves. If you keep your finger on the trigger, this will block the pan axis in order to make some impressive travellings. An other thing which is very important according to us and which mattered in our DJI Osmo Mobile review is that the taking in hand of the grip is very pleasant...even though it’s a bit shorter than what we would have expected. You will easily manage to add accessories and extension poles to your smartphone stabilizer, though. You will also be able to add microphones or fix your gimbal on a tripod thanks to the 1/4″ whole. In the end, everything has been well thought for this smartphone stabilizer in order for it to be really pleasant to use. This is why we graded this category with a 8,7/10 in our DJI Osmo Mobile review. 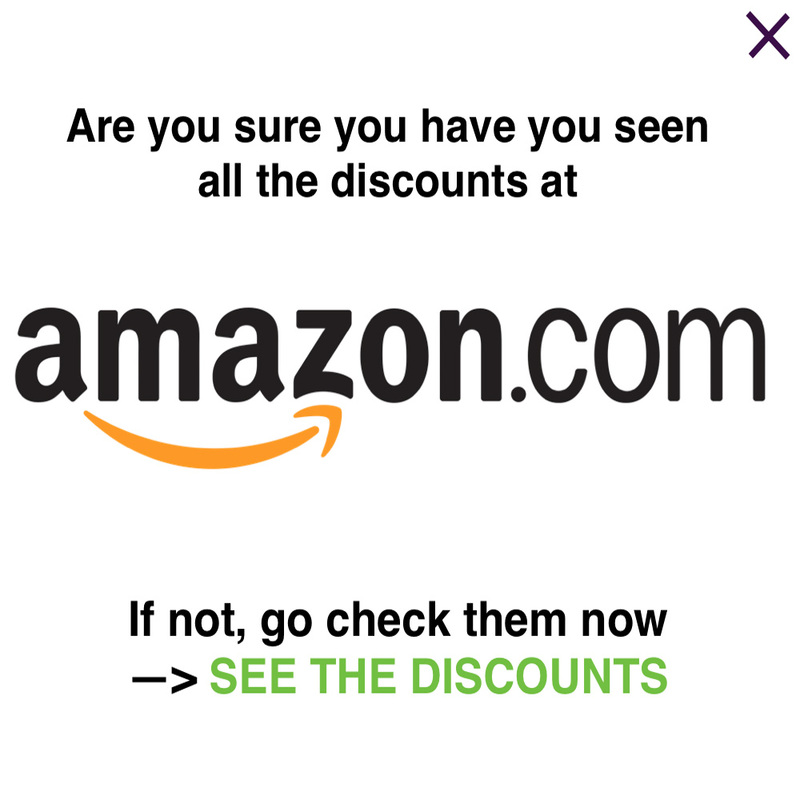 Now, the last thing you want to know is certainly the price. You’ll see it in the next part which will conclude this DJI Osmo Mobile review. Last section of our DJI Osmo Mobile review, the price ! With a current price of approximately 299$ on the official website, this smartphone stabilizer is a bit expensive according to us. Even though we pointed out a lot of assets during this DJI Osmo Mobile review, we would have enjoyed finding it at 270$ approximately, which seems to be the fair price for us. With such a price, it would have been closer to the market average. Yet, never forget that DJI always prices its products with a significant premium, and it is still true here. The high price is mainly explained by the lot of money which is invested in Research and Development by the manufacturer and we can only thank it for that. All along during this DJI Osmo Mobile review, we managed to see that the money we spend doesn’t vanish in the air. Just below you can see the summary of the pros and cons for this smartphone stabilizer we presented during this DJI Osmo Mobile review. 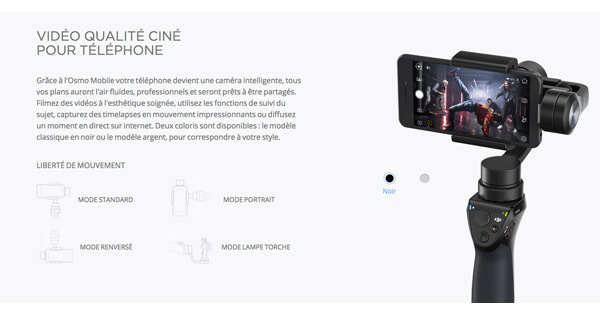 Les plus : The numerous functions and options, the Tracking Mode, the awesome panoramas, the battery life and the comprehensive grip which is very easy to use. Les moins : The price, the stabilisation compared with other smartphone gimbals and the quite important dependance on the mobile application which consumes a lot of battery. Our DJI Osmo Mobile review leads us to a very good grade of 9.1/10. As we’ve seen it during this DJI Osmo Mobile review, the versatility of the functions and the battery life of this smartphone stabilizer are its main strengths on which it relies a lot. We strongly recommend you this awesome stabilizer.